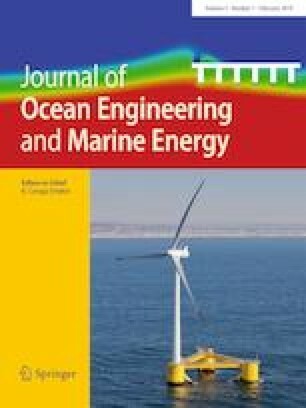 This paper presents the numerical modelling of a novel vertical axis tidal turbine that incorporates localised flow acceleration and variable-pitch blades. The focus is to develop a computational fluid dynamics model of a 1:20 scale model of the device using ANSYS® Fluent®. A nested sliding mesh technique is presented, using an outer sliding mesh to model the turbine and additional inner sliding meshes used for each of the six blades. The turbine sliding mesh is embedded in an outer static domain which includes the flow accelerating bluff body. Modelled power performance and velocity data are compared with experimental results obtained from scale model tests in a recirculating flume. The predicted power curves show general agreement with the measured data; the relative difference in maximum performance coefficient for example, is just 5.7%. The model also accurately reproduces measured flows downstream of the turbine. The verified and experimentally validated model is subsequently used to investigate the effects of the variable-pitching and number of blades on device performance. The authors wish to acknowledge the DJEI/DES/SFI/HEA Irish Centre for High-End Computing (ICHEC) for the provision of computational facilities and support. The authors also wish to acknowledge the contribution of Dr. Ciaran Kennedy to the experimental testing of the device. This material is based on works supported by Science Foundation Ireland under Grant No. 12/RC/2302 through MaREI, the national centre for Marine and Renewable Energy Ireland.